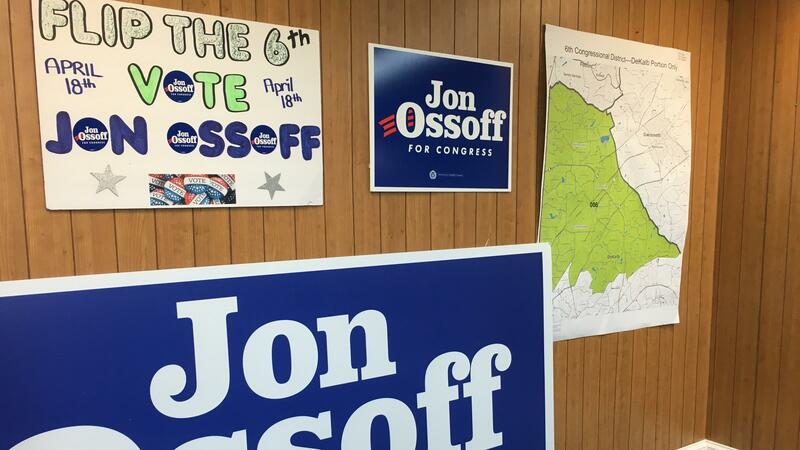 Campaign signs and map adorn the walls of Democratic congressional candidate Jon Ossoff's campaign office in Chamblee, Ga.
Democratic congressional candidate Jon Ossoff greets a volunteer at his Sandy Springs campaign office on Saturday afternoon. Christina Ferguson and Anna Cay Robertson canvass for Democrat Jon Ossoff ahead of Tuesday's special election in Georgia's 6th District. Megan Tucker tells them she is voting for Ossoff. Johnson, 58, is an attorney in Sandy Springs who's lived in the area for more than 20 years. He lamented that Democrats have never put up anyone other than a sacrificial lamb to run against Republican candidates here, particularly former Rep. Tom Price, whose appointment as President Trump's secretary of Health and Human Services triggered Tuesday's special election. But the combination of a wild 18-way all-party primary, a rapidly changing district that Trump only barely carried, and an energized Democratic base nationally has raised expectations that Ossoff, a 30-year-old documentary filmmaker and former congressional staffer, could actually pull off the unthinkable on Tuesday — winning outright with 50 percent of the vote. 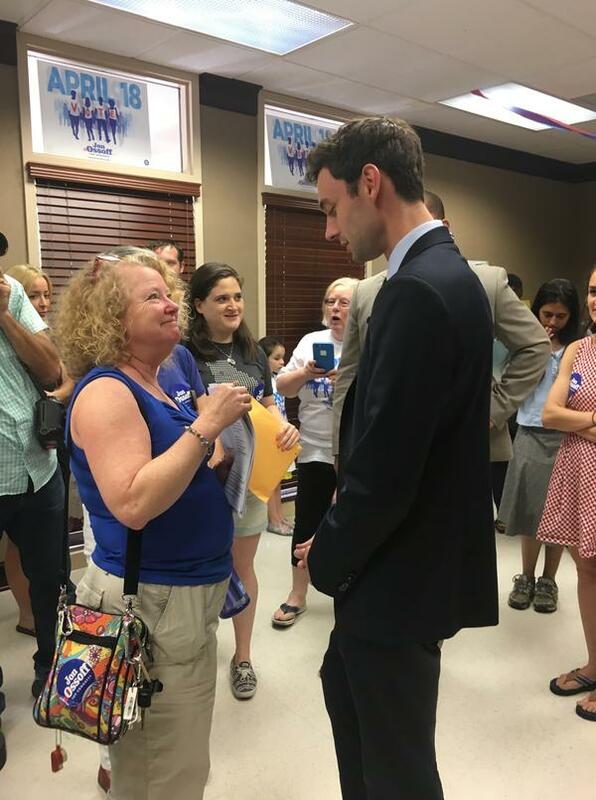 "We are within striking distance," Ossoff told a room full of volunteers gathered in his Sandy Springs campaign office before they began to head out to canvass. "Every piece of data we have says this thing is winnable on Tuesday." Most polling shows Ossoff hovering in the mid-40s in polling, with a quartet of Republican candidates — Georgia Secretary of State Karen Handel, Johns Creek City Councilman Bob Gray, state Sen. Judson Hill, and former state Sen. Dan Moody — further back. Republicans hope to hold Ossoff under 50 percent, and whichever GOP candidate comes in second would likely have a better shot against him in the June 20 runoff. But Ossoff and his army of volunteers smell blood in the water and want to deliver a knock-out punch on Tuesday — something the Democratic candidate said would reverberate well beyond the Northern Atlanta suburbs. "This is a pretty extraordinary moment for Georgia," Ossoff continued to his supporters that had come out on the final weekend of the campaign. "The eyes of the whole nation are on us. The eyes of the world are on us. And it's a rare chance for us to stand up and make a statement about what we stand for, and to prove that we believe in a country that is decent and kind, compassionate, courageous and tough, that we reject fear and division, that we stand together in all of our diversity, working for a better community here, and a better country." Ossoff never mentioned Trump by name in his remarks, but in just a few short months, his campaign has become one of the primary vehicles for resistance to the president. With the help of progressive blogs like Daily Kos and celebrity endorsements on social media, Ossoff has raised an astounding $8.3 million. That's enabled him not just to blanket the airwaves but to also build a massive field operation that has many Republicans rightly worried. He may have gotten much of the party's liberal wing behind him, but Ossoff's ads on television tout places where he'd stand up to his party, like reining in spending and working to boost infrastructure. Some of his TV spots talk about how he'd stand up to Trump, but others don't even mention his party affiliation at all. And Ossoff was right that the race has certainly attracted plenty of national attention, given what an upset might portend for Democrats' chances at taking back the House in 2018. National Republicans have tried to blunt his financial advantage, pouring more than $4 million of their own money into the race to try to tear Ossoff down, claiming he's embellished his resume and would vote in lock-step with national Democrats. About 95 percent of Ossoff's fundraising has come from out-of-state, and as WABE's Johnny Kauffman reported, many of the volunteers coming to help in the campaign's final push are from out-of-state. But among the group gathered in Sandy Springs on Saturday morning, it's a mix of young and old volunteers, most of them from this very district who, like Bruce Johnson, can't believe that this traditionally red area is even on the map with the potential to flip. Christina Ferguson, 64, is from Sandy Springs and said she hasn't gotten involved politically since the 1960s and the Vietnam War era. But after Trump's election, just voting wasn't enough for her anymore, and she's about to begin her third time canvassing for Ossoff. "I was shocked on election night," Ferguson said. "I never thought that Trump was a viable candidate. I thought that the country would wake up at some point." But now, she hopes a win by Ossoff on Tuesday could send a message that reverberates to Washington and sends a message to the president. "I think that he's a Democrat who is willing to work with both sides of the aisle," Ferguson said of Ossoff. Her friend Anna Cay Robertson, 68, was also back to knock on more doors for Ossoff. Frustrated by what happened in November, she said Ossoff was the first political candidate she'd ever donated to. "I have never been politically active in my life. I've voted every year, but I've never been prompted to do anything until this last administration was elected, and I was so disheartened," said Robertson. "I felt like I had to do something. 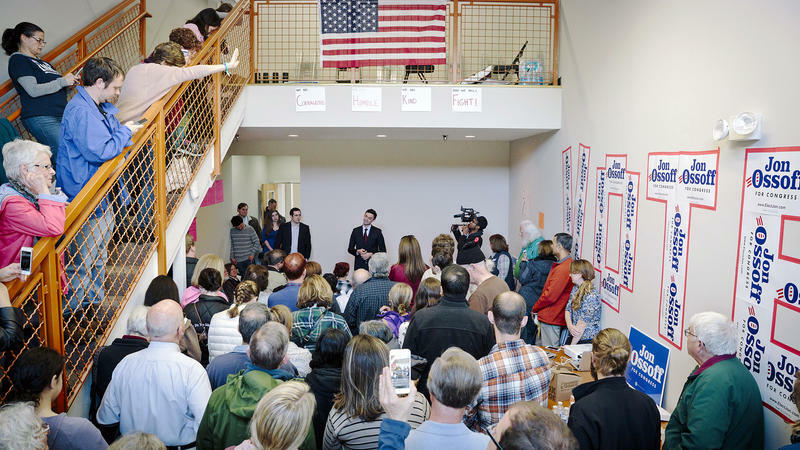 And Jon, to me, represents fresh, young, moderate blood that we need in Washington, and I'd like to see more young people with fresh ideas get there." Ferguson and Robertson headed out to a neighborhood a few miles away to knock on doors in a subdivision where several Ossoff signs already dotted the well-manicured yards. 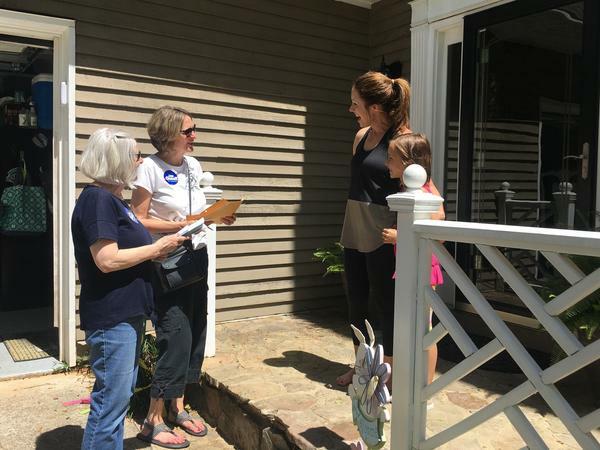 Many people weren't home on the beautiful spring day, while some answered the door and vented their frustration over the several visits from various campaigns they'd gotten over the race and complained about the ad nauseum ads. A few told the two women they were voting Republican, including one man whose wife wasn't home, but he assured them that while he was voting GOP his wife's support for Ossoff would cancel his vote out. Their knocking at one home awoke a woman who was sleeping because she worked the night shift, but she wasn't perturbed. Instead she told Ferguson and Robertson how excited she was over Ossoff and asked if they could circle back with a yard sign later. Another man said he'd already voted early and wouldn't say who he voted for, but when prodded did offer a coy smile, telling the two women they'd be happy with his vote. Along one home toward the end of their route, Megan Tucker bounds out and tells the two women she's definitely behind Ossoff, and Ferguson and Robertson let out small cheers. Tucker says she usually votes Democratic but considers herself an independent. "I like that he's younger and fresh and seems to be focusing on a lot of the issues that are important to us, as a family with younger children," Tucker said. "I am seeing an independent thinker." Democrats have a long way to go to rebuild their party after brutal losses across the board last November. 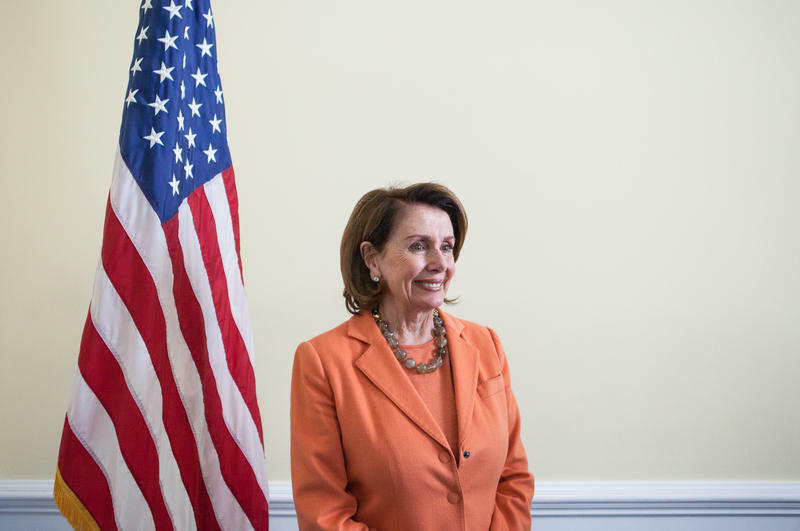 But they're seeing glimmers of hope in recent and upcoming special elections where they argue the backlash to President Trump is resulting in change at the ballot box. 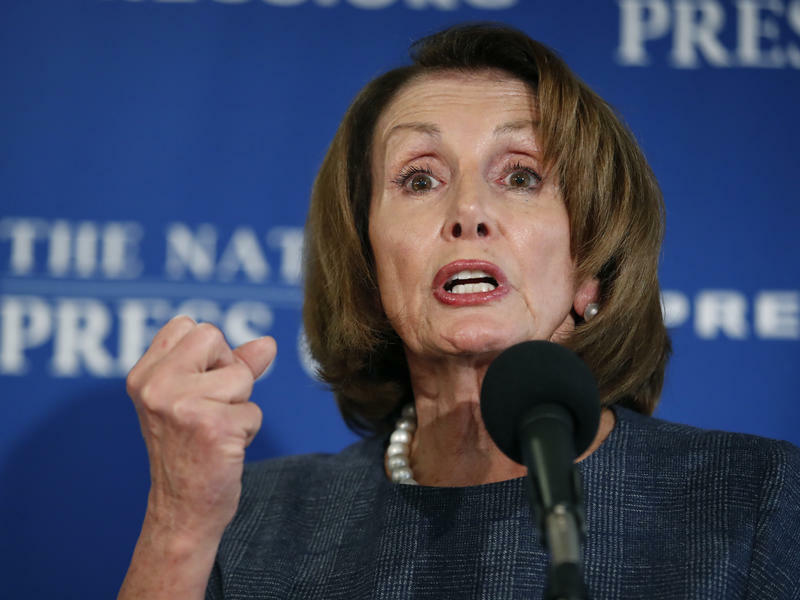 She says that although Democrats don't have the votes to stop the GOP legislation alone, they can still show their opposition to it.